This is not your ordinary stuffed pepper recipe! Enjoy a fantastic blend of sweet and savory in outstanding dish featuring Apple Chicken Sausage. Prepare rice according to package directions substituting chicken broth for water. Cut tops off peppers and remove seeds and veins. Rub peppers with 1 teaspoon olive oil and slightly salt and pepper the inside. Place peppers cut side up in a baking dish. Roast for 30 minutes or until peppers are tender. Meanwhile heat remaining teaspoon of olive oil in a large skillet over medium heat. Saute sausage until lightly browned. Add onions and celery and continue to saute 4 minutes. Add mushrooms and cook until vegetables are tender. Add cranberries, apple, apricots, raisins, sage, and oregano. Cook and stir until fruit is softened, about 5 minutes. Stir in cooked rice and heat through. 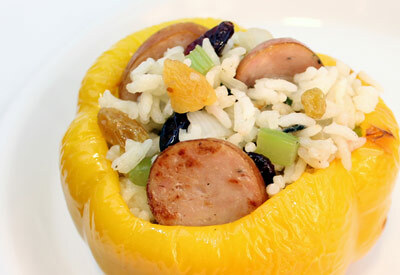 Fill prepared peppers with sausage/rice mixture.